Earlier this month, the Chinese government decided to depreciate its currency on three consecutive occasions. On August 13, the price of the US dollar was trading at 6.413 — an increase of 3.3 percent against July. 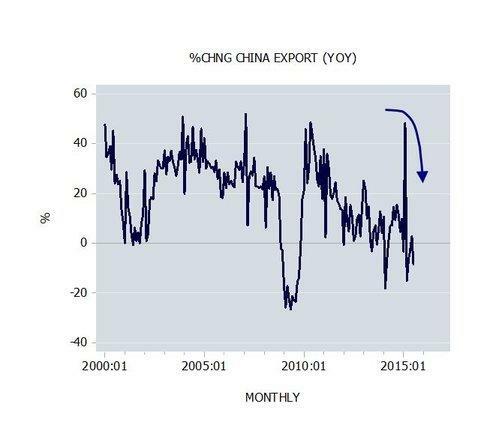 The key factor behind the central bank’s lowering of the yuan is a sharp decline in the growth momentum of exports with the yearly rate of growth falling to minus 8.3 percent in July from 2.8 percent in June. It is held that by means of currency depreciation that it is possible to strengthen the export of goods and services, thereby strengthening the gross domestic product (GDP), which currently displays a visible weakening. 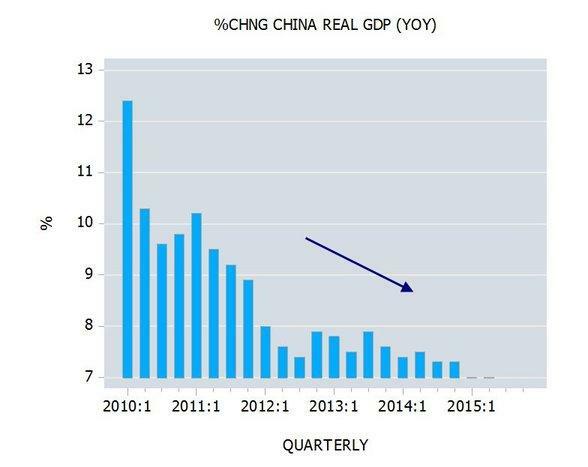 The yearly rate of growth of real GDP stood at 7 percent in Q2 against 7.5 percent in Q2 last year and 8.6 percent in Q1 2012. According to popular thinking, the key to economic growth is demand for goods and services. It is held that increases or decreases in demand for goods and services are behind rises and declines in the economy’s production of goods. Hence in order to keep the economy going economic policies must pay close attention to overall demand. Now, part of the demand for domestic products emanates from overseas. The accommodation of this demand is labeled “exports.” Likewise, local residents exercise demand for goods and services produced overseas, which are labeled “imports.” Observe that while an increase in exports implies an increase in the demand for domestic output, an increase in imports weakens demand. Hence exports, according to this way of thinking, are a factor that contributes to economic growth while imports are a factor that detracts from the growth of the economy. From this way of thinking it follows that since overseas demand for a country’s goods and services is an important ingredient in setting the pace of economic growth, it makes a lot of sense to make locally produced goods and services attractive to foreigners. One of the ways to boost foreigners’ demand for domestically produced goods is by making the prices of these goods more attractive. 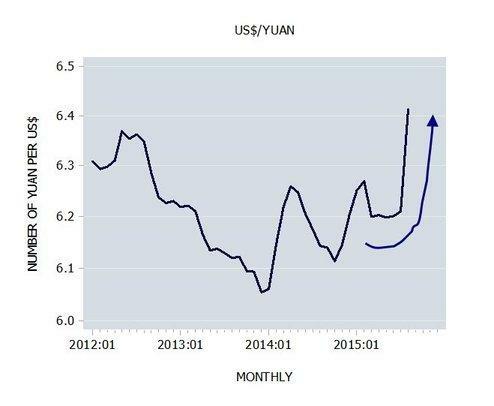 One of the ways of boosting their competitiveness is for the Chinese to depreciate the yuan against the US dollar. Based on this one can reach the conclusion that as a result of currency depreciation, all other things being equal, the overall demand for domestically produced goods is likely to increase while also lowering Chinese demand for American goods. This in turn will give rise to a better balance of payments and in turn to a stronger economic growth in terms of GDP. What we have here, as far as the Chinese is concerned, is more exports and less imports, which according to mainstream thinking is great news for economic growth. When a central bank announces a loosening in its monetary stance this leads to a quick response by participants in the foreign exchange market through selling the domestic currency in favor of other currencies, thereby leading to domestic currency depreciation. In response to this, various producers now find it more attractive to boost their exports. In order to fund the increase in production, producers approach commercial banks which — on account of a rise in central bank monetary pumping — are happy to expand their credit at lower interest rates. By means of new credit, producers can now secure resources required to expand their production of goods in order to accommodate overseas demand. In other words, by means of newly created credit, producers divert real resources from other activities. As long as domestic prices remain intact, exporters record an increase in profits. (For a given amount of foreign money earned they now get more in terms of domestic money.) The so-called improved competitiveness on account of currency depreciation in fact amounts to economic impoverishment. The improved competitiveness means that the citizens of a country are now getting fewer real imports for a given amount of real exports. While the country is getting rich in terms of foreign currency it is getting poor in terms of real wealth (i.e., in terms of the goods and services required for maintaining people’s life and well being). The much talked about advantages which devaluation secures in foreign trade and tourism, are entirely due to the fact that the adjustment of domestic prices and wage rates to the state of affairs created by devaluation requires some time. As long as this adjustment process is not yet completed, exporting is encouraged and importing is discouraged. However, this merely means that in this interval the citizens of the devaluating country are getting less for what they are selling abroad and paying more for what they are buying abroad; concomitantly they must restrict their consumption. This effect may appear as a boon in the opinion of those for whom the balance of trade is the yardstick of a nation's welfare. In plain language it is to be described in this way: The British citizen must export more British goods in order to buy that quantity of tea which he received before the devaluation for a smaller quantity of exported British goods. Contrast the policy of currency depreciation with a conservative policy where money is not expanding. Under these conditions, when the pool of real wealth is expanding, the purchasing power of money will follow suit. This, all other things being equal, leads to currency appreciation. With the expansion in the production of goods and services and consequently falling prices and declining production costs, local producers can improve their profitability and their competitiveness in overseas markets while the currency is actually appreciating. 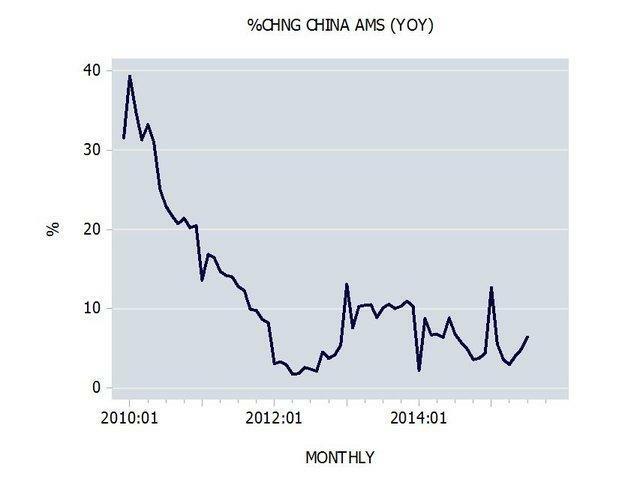 The economic slowdown in China was set in motion a long time ago when the yearly rate of growth of the money supply fell from 39.3 percent in January 2010 to 1.8 percent by April 2012. The effect of this massive decline in the growth momentum of money puts severe pressure on bubble activities and in turn on various key economic activity data. Any tampering with the currency rate of exchange can only make things much worse as far as the allocation of scarce resources is concerned.